The final qualifier was fished today. Temperatures had dropped to just 6C on the morning. Later, the temperature warmed up to around 16C with a gentle easterly breeze. Winner today and grabbing the final qualification place was Danny Bache (Bag’em) who drew peg 35 on the Match Lake. Danny fished a simple match feeding his edges with pellet and corn with pellet or corn on the hook. The carp were there in numbers all match and he finished the day with a very impressive 243-00-00. 2nd on the day was Phil Canning (Frenzee) who drew peg 26 in the channel of the Match Lake. Fishing the method tight to the island and later down his edges with dead reds landing 239-10-00, just one fish short of the winner. 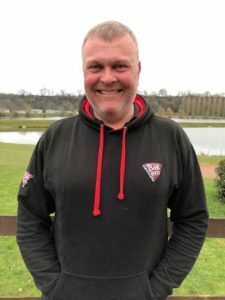 3rd placed Simon Richardson (Dotem down Fatty’s) drew peg 30 on the match lake and fished paste all the day down his margins weighing in 210-10-00. 4th in the frame was Grant Albutt (Drennan) who drew peg 28 on the Match Lake. Grant fished the method with pellet tight to the island and later fished the 6m pole with meat -landing 192-07-00. 5th overall was Scott Jones (Miracle Baits) with 179-11-00. Scott fished the pellet at 6m and later down his edge with dead reds fished over ground bait. 6th in the frame was Sam Brown (Maver) who drew peg 12 on the Match Lake. Sam weighed in 176-04-00 fishing his edges with dead reds over ground bait. Our thanks to all the Larford Staff for hosting another superb qualifier. The 23rd qualifier took place today. Conditions on the day was a big change with highs of just 14C and a stiff breeze with heavy rain showers all day. Winner today was Partridge regular Chris Weeder Jnr (Maver NW / Spotted fin) who drew peg 56 on Covey 3. Chris fished hard pellet short and maggot shallow landing 178-00-00 of carp and F1’s. Chris now progresses to the September 15th Grand Final. Mitch also caught on hard pellet short and casters shallow weighing in 171-03-00 of carp and F1’s. Third on the day was Ryan Bennett (Matrix Halifax) who drew peg 53 on Covey 3. Ryan caught most of his fish on casters shallow and later down his edge on hard pellet finishing the day with 146-03-00. 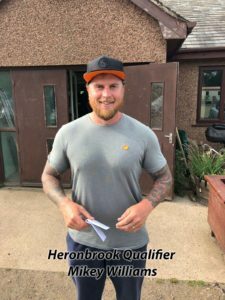 Fourth placed Lee Thornton (Middy) drew peg 85 on Covey 4 and fished hard pellet at 13m to depth catching carp and F1’s for a total weight of 140-09-00. Fifth in the frame was Matt Goodall (Marukyu) from peg 121 on Covey 5. Matt fished pellet on the deck and caster shallow weighing in 132-08-00. Sixth overall was Craig Haslam from peg 83 on Covey 4. Craig fished most of his match with casters shallow and later down his edge with hard pellet to record a weight of 132-00-00. Our sincere thanks to Barbara and all the Partridge staff for hosting another brilliant qualifier. A very talented field of 83 anglers turned out in a blistering 30C heat with little breeze to cool things down. Fish on both the Specimen and Match Lakes were swimming around shallow so many of the participating anglers targeted the pellet waggler or pole shallow. Winner today was Dave Roberts (Tricast) with a magnificent 337-07-00 of carp all caught on the pellet waggler from the Specimen Lake, peg 7. From the off Dave was into carp to 18lbs and later caught a few big units down his edge with corn over groundbait. Dave was also knocked back on his weight as he went over the 75lbs net limit on three of his nets so his weight would have been closer to 390lbs which would have set a new Specimen Lake record. All that being said, Dave put in a class performance and now looks forwards to a £50,000 finalist placing in September. Second on the day was Polish star Prezmek Solski who continues to impress on both the feeder and pole skills. Prezmek drew peg 1 on the Specimen Lake and fished the pellet waggler taking over 100lbs in the first hour of the match. 3rd on the day was Perry Stone who drew Match Burr peg 42. Perry caught from the off fishing down his margins and short with pole and meat over groundbait. Perry finished the day with 269-13-00 of carp and F1’s. He also tipped back over 25lbs of small F1’s to make space for the bigger carp he was catching so could have finished the day with over 290lbs which would have secured 2nd place. 4th to the frame was Danny Bache (Bag’em) who drew peg 35 on the Match Lake with 244-08-00. Dan caught shallow with meat and pellet on the long pole and later switched to his edge with meat. 5th overall was Chris Cameron (Middy) who drew peg 64 on the Match Lake. 6th place went to Nick Smith from peg 78 on the Specimen Lake. Nick targeted the carp shallow with long pole and pellet and later down his margins with corn over groundbait landing a superb bag of carp that weighed in at 236-13-00. So one can say, Larford really did produce its magic. Our thanks to all the Larford team for hosting this big weigh qualifier. Partridge Lakes on Friday 24th August. Be sure to book your ticket to be in with a chance of that £50,000 prize. The 21st qualifier took place today at the popular Lindholme fisheries. Conditions today, very warm with a gentle breeze. 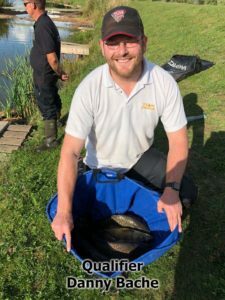 85 anglers competed for a place in the September Grand Final and it was Dale Shepherd (Maver / Bag’em) who progressed to the second Golden Reel final. Dale drew peg 41 on the Laurels Lake and fished paste down his edge and casters shallow. 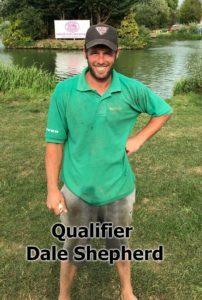 Dale, who has been close to qualifying on several occasions weighing on 195-00-00 of carp and F1’s and now rewarded with his place in the final. Chasing all the way to the final whistle was Keith Pearson who drew peg 19 on Laurel. Keith fished caster shallow all day to finish his match with 188-12-00 just 6lb behind the winner. 3rd placed Howard Kelly (Matrix LTB) drew peg 20 on the willow and also fished his entire match on caster shallow. Again, a big ton was recorded but his efforts fell just short recording a weight of 181-02-00. 5th to the frame was Steve Rothery who drew peg 36 on Bonsai. Steve fished the bomb & pellet and later switched to his edges with corn & pellet to record 166-13-00 of carp and F1’s. 6th Overall was Tony Evans from peg 13 on Bonsai. So all in all, the inform Lindholme Lakes hosted a brilliant match. 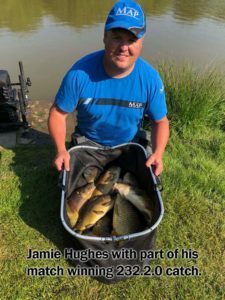 There was a considerable number of 100lbs plus weight confirming Lindholme as one of, if not the best commercial fishery in the north of England. Our sincere thanks to all the staff. The continued heat wave meant that the participating field of anglers faced temperatures of 26C with no breeze. Fish as expected were swimming around shallow on all the lakes. Winner of the 20th qualifier of the series was Dan Hull (Dynamite Baits) with a massive 315-14-00 of carp. Dan’s approach was kicked into action fishing pellet shallow, which produced an early run of quality carp. During the match, Dan switched to the 5m pole line fishing corn & pellet and later in the match, his edges produced well. Dan drew peg 28 on pool1 and finished the match 46lbs clear of his nearest rival. We look forwards to seeing Dan in the September final. 2nd on the day was Steve Openshaw (Lindmere) who again just missed out of a grand final placing. Steve has finished in second and third place on countless occasions so hopefully will qualify from anyone of the remaining 4 qualifiers. Steve drew peg 24 on Lake 1 and chose to fish most of his match down the edge with corn weighing in a very impressive 269-03-00. Jamie fished most of his match on the long pole shallow and later switched to his edges to bag an impressive 252-13-00. 4th on the day was Richie Hull (Garbolino) who drew peg 1 on lake 1. Richie fished bomb & pellet tight to the far reeds taking a steady run of carp. Later, switching to the long pole with pellet shallow then finishing his match with a run of carp down his edges to weigh 238-10-00. 5th to the frame was Warren Jennings (Bag’em) with a weight of 232-00-00. Warren drew peg 80 on lake 5 catching carp to long pole shallow with pellets and paste short. 6th overall was Luke Bamford who drew peg 94 on pool 6. Luke fished paste short and down his edge to finish the day with 212-12-00. Our thanks to Roy Marlow and all his staff for hosting yet another brilliant qualifier. Weights were tremendous with 6 or 7 weights over 200lbs, countless 100lbs+ weights plus that magical 315lbs winning catch. 63 anglers turned out for this latest qualifier at the popular Heronbrook Fisheries. Conditions on the day were highs of 26C with a little or no breeze and extremely humid. The winner today was Matt Godfery (Guru) who drew Bridge Lake, peg 5. Matt fished caster shallow feeding heavily all match and later switched to his edges with meat to bag a huge catch of F1’s and carp weighing in 263-06-00. 30lbs clear of his nearest rival. So another Guru angler makes his way to the September Grand Final. Second on the day was Jordan Holloway (Catch More Media) who drew peg 40 on the Match Lake. 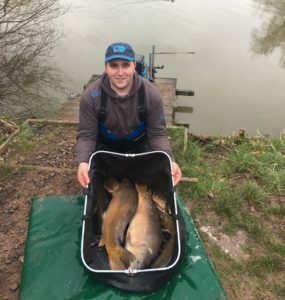 Jordan targeted the carp swimming shallow with meat and also fished short with caster to land a superb bag of carp and F1’s that tipped the scales at 236-11-00. 3rd placed Darren Oliver drew the Island Lake, peg 19 weighing in 216-06-00 of carp and F1’s. Darren caught most of his fish casting a method feeder to the island. 4th on the day was Mike Senior (Warrington Tackle & guns ). Mike drew the Bridge Pool, peg1 weighing in 215-08-00 fishing pellet shallow. 5th in the frame was Connor Barlow (Guru) who drew the Match Lake, peg 6. Connor fished the caster shallow all day landing a brilliant 207-02-00 of F1’s. 6th Overall was Paul Carnwell (Garbolino, Bait Tec) with 202-08-00 from peg 15 on the Match Lake. Paul’s attack was caster shallow which produced a fine catch of quality F1’s. So in all, six weights over 200lbs with many weights of 100lbs + recorded. Our thanks to Neil Dale and his fishery staff at Heronbrook for hosting yet again a superb Golden Reel Qualifier. One can only describe today’s match as having conditions that would compare to temperatures similar to Africa with highs of 29-30C. As luck would have it, we were blessed with a cooling east wind, which did help the field of angler get to grip with the scorching conditions. Fish were swimming shallow on all the lakes so difficult to catch but as ever, the brilliant Glebe complex produced no fewer than 29 weights over 100lbs and 3 weights breaking the magical 200lbs barrier. 86 anglers fished today and it was Jake King (Trabucco / Bag’em) who won the day with a very impressive 227-15-00. Jake drew peg 86 on pool 6 and fished the pellet waggler with 6mm banded pellet and later switched to his margins fishing worm over micro pellets. Chasing Jake was Jack Harness (Daiwa) who drew peg 129 on lake 9. Jack fished caster shallow long down his reed edges and also found carp short on pellet. Jack finished the day with 209-13-00. 3rd in the frame was Sam Collett (Guru / Dynamite Baits) from peg 1 on pool 1. 4th on the day was Barry Mason (Guru) who drew peg 84 on lake 5. Fishing the short pole with hard pellet and later tight down his edges, Barry recorded a weight of 158-04-00. 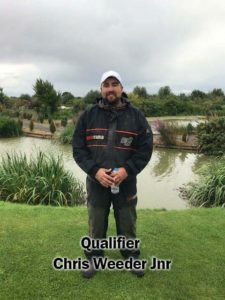 5th placed Phil Canning (Frenzee) drew peg 91 on pool weighing in 156-07-00 to the pole fished at just 5m with hard pellet. 6th in the frame was Richard Holmes (Jewsons, Halifax) with 145-14-00. Richard drew peg 30 on Lake 1 fishing the long pole shallow with cornskins. Later fishing at 10m and down his edge with paste to bag a fine bag of quality carp. 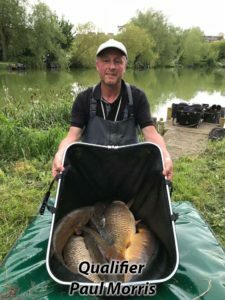 So again the brilliant Glebe produced some superb weights and our thanks to Roy Marlow and all his fishery staff for hosting this excellent qualifier. Bright sunshine, but a stiff breeze greeted the field of anglers hoping to secure a place in the September Grand Final for a shot at the £50,000 prize. The resident carp were swimming around shallow but difficult to catch and the edge fish fed late in the match. Winner today was Andy Stepney from Grantham who drew peg 26 on the Oak Lake. Andy fished most of his match down the edge, feeding micro pellet with corn, dead reds and worm hook baits he found some good quality carp to 8lbs to finish the day with 166-03-00. Chasing the winner hard was second placed Dale Shepherd (Maver / Bagem) who finished the day just 2lb short of the winner. Dale drew peg 18 on Cedar and fished micro pellet down his edges with worm hook baits, finishing the day with 164-04-00. 3rd placed Nick Smith drew peg 6 on Oak landing 159-12-00 fishing down his edges, feeding micro pellet and worm hook baits. 4th on the day was Daniel Brydon (Wensom Valley AC Matrix) who drew peg 3 on the Beastie Lake. 5th to the frame was Ben Bell (Maver) who fished the long pole with pellet. Consistently pinging pellet, Ben went on to land 149-11-00 from peg 1 on the Oak Lake. 6th overall was Tom Edwards (Frenzee / Dynamite ) who drew peg 24 on Cedar Lake. Tom fished down his edges over micro pellet and worm hook baits landing 148-07-00. A very big thank you to Decoy Lakes for hosting yet another superb qualifier. Conditions were again difficult. A strong SW wind hit the lakes all day and there was bright sunshine with highs of around 20C. Clearly there was a pressure change and the bream & carp were reluctant to feed. The winner was Jason Brown (Maver Midlands / Dynamite Baits) who drew peg 37 on the Match Lake. Jason had the advantage of some extra space and made the most of his draw landing a fine catch of carp and F1’s for a total weight of 133-12-00. Jason caught all of his fish on corn down his edges and now progresses to the September Grand Final. 2nd on the day was Larford fishery bailiff, Martin Harrell who drew peg 16 on the Arena Lake. The Arena was also moody with fish swimming shallow but hard to catch. Martin’s approach was bomb and pellet with loose fed pellets in quantity. At the whistle, Martin weighed in 108-06-00 of carp to 8lbs. 3rd placed Matt Greening (Milo / Bait Tec) drew peg 64 on the Match Lake and fished short on the pole with pellet. Later in the match, Matt switched to his edges with meat finding some quality carp to finish the day with 108-03-00. 4th in the frame was Simon Harris (Telford) from peg 54 on the Match Lake. Later switching to his edge with 8mm pellet and corn, Simon found some of the larger carp to finish the day with 104-05-00. 5th placed Phil Canning (Frenzee) drew peg 14 on the Specimen Lake landing 98-02-00 of carp. Phil fished the method at 20m with dead reds and later down his edge over ground bait with dead reds as hook bait. 6th overall was John Jones with 90-11-00 from peg 48 on the Match Lake. John fished short on the pole with pellet and later switched to his edges with meat. Our thanks to Larford Lakes and all the staff for hosting an excellent qualifier. Conditions today were not ideal as the field of anglers faced flat calm lakes, bright sunshine with highs of around 24C. Fish were swimming shallow so the main plan of attack was to fish shallow with casters and pellet. The winner was Welsh International Mikey Williams (Guru / Mainline) who drew peg 3 on the Island Lake. Mikey fished maggot shallow to catch a superb 247lbs of quality F1’s and carp. Later in the match, Mikey switched to his edges fishing over ground bait to boost his F1 catch with some quality carp. 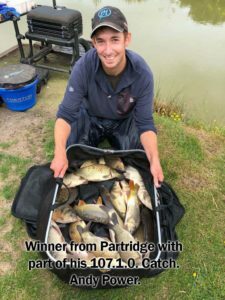 Well done Mikey, who now progresses to the September Grand Final at Larford Lakes. Chasing Mikey all the way was Kirk Webber who drew peg 13 on the Island Lake. 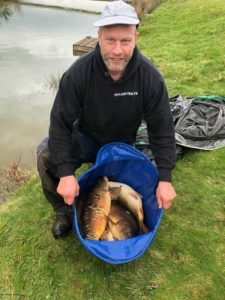 Kirk also chose to fish caster shallow landing a brilliant bag of quality F1’s for a total weight of 238lbs backed up with some carp down his edges over ground bait with dead reds as hook bait. Peter drew peg 19 on the Island Lake and also fished caster shallow recording an all F1 weight of 218lbs. 4th placed Matt Higgins (Matrix Leigh Tackle & Bait) chose to fish the method to start and later switched to his shallow rig with casters to record a superb 195lbs of big F1’s and a few carp. 5th overall was Stockport’s Damien Bracken (Garbolino). Damien drew peg 26 on the Bridge Lake and fished caster shallow all match to weigh 185lbs of F1’s and carp. 6th in the frame was Grant Albutt (Drennan, Dynamite Baits) with 140lbs from peg 6 on the Canal Lake. Once again, some superb weights were recorded and our thanks to the Heronbrook Fishery and all their staff. Clearly, HeronBrook is without doubt, one of the best F1 venues in the country. The near sell out field had to chase cruising carp with pellet wagglers and shallow pole tactics. Needless to say, the carp were very difficult to catch and swimming around in numbers shallow on just about every peg. 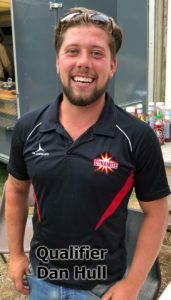 It was Jack Danby (Matchman Supplies / Dynamite baits ) who took the honours, qualifying for the September £50k final with a weight of 120-04-00 from peg 69. Jack fished at 16m with the pole fishing shallow with banded hard pellets and constantly pinging pellets. Most of Jack’s fish were quality carp which came steadily all day. 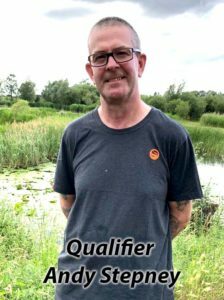 2nd on the day was Andy Power (Preston) who had qualified from the previous day at Partridge Lakes. Rather than waste his ticket, Andy decided to fish and was rewarded with a superb bag of carp, all caught on the pellet waggler from peg 55. Andy finished the day with 119-08-00. 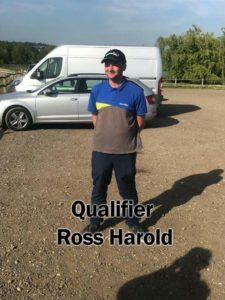 3rd placed Mark Skidmore (Larford) drew peg 13 and started his match taking a couple of early fish on the pellet waggler. Later switching to bomb & pellet and method feeder casting just 30m, Mark went on to land 79-04-00 of carp and F1’s. 4th overall was Simon Wilsmore (Rive) who drew peg12 and started his match casting around 30m with the method feeder and boilie hook baits. Simon fed 8mm pellets over the top and was rewarded with 70-08-00 of quality carp and F1’s. 5th in the frame was Adam Playford (Dersingham) who drew peg 16 landing 67-10-00 of carp and F1’s to the method feeder fished at 30m. 6th overall was Geoff Valance (Preston) with 56-14-00 from peg 71. Geoff fished all of the match with pellet waggler. Our thanks to Nigel and all the Barston fishery staff for hosting an excellent qualifier. Warm humid conditions for this latest qualifier with little or no breeze but overcast. Fish had begun spawning and weights were down on previous matches. The field was below normal due to difficult conditions due to spawning. 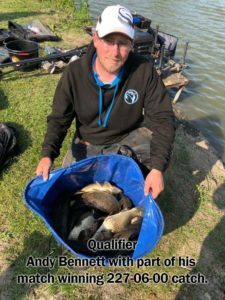 52 anglers turned out hoping to clinch a grand final placing and it was the legend himself, Andy Power (Preston) who progresses to the September £50k final. Andy drew peg 128 on covey 5, fishing at just 7m with maggot down the track, Andy caught steadily all match to weigh in 107-01-00 of F1’s and carp. Chasing Andy was John Jones (Garbolino) who drew peg 2 on covey 1. John fished the same tactics, fishing at 7m with maggot and later down his edge with worm over gorundbait to weigh 94-05-00 of carp and F1’s. 3rd on the day was England junior international Kristian Jones (Tricast / Bag’em) who drew peg 27 on covey 2. Kristian also fished down the track with maggot landing 82-12-00. 4th placed Barry Grigg drew peg 85 on covey 4 and fished 6mm pellet to depth and loose fed pellets to land 74-01-00. 5th placed Barry Bush (Birkenhead) drew peg 31 on covey 2. Barry fished down the track with maggot landing 74-01-00 of quality F1’s. 6th to the frame was Pete Tickle (Maver N/W) who drew peg 110 on covey 5. He also fished down the track landing 71-04-00 of F1’s. Indeed, conditions proved to be difficult and the fish clearly had other things on their mind. That being said it was a great match and very well hosted and organised by Partridge Lakes. Our thanks are extended to Barbara and all the fishery staff. 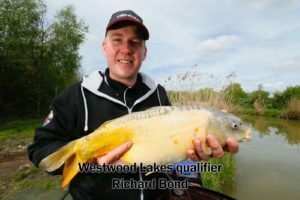 The twelfth Golden Reel qualifier took place at the popular Lindhome Lakes on Sunday. The only down side was a strong easterly wind that made for difficult presentation with the pole on some of the pegs. Winner of this qualifier was fishing machine, Andy Bennett, who now progresses to his second Golden Reel Final. Andy drew peg 19 on the Laurel Lake and chose to fish the long pole directly to an island with corn over pellet feed. He fished a faultless match and it was indeed a please and education to watch him. The Guru / Tricast /ABC sponsored F1 master landed carp and F1’s from the whistle finishing the day with a tremendous 227-06-00. Second on the day was Preston sponsored Frankie Gianoncelli who drew peg 5 on Laurel. Frankie had a slow start but a change of wind direction provided him with the opportunity to feed casters shallow and F1’s came thick and fast. At the scales, Frankie weighed in a level 180lbs all to the 14m pole with caster hook bait. Third placed Stuart Fotheringham (Daiwa) drew peg 13 on Laurel and fished caster shallow at 10m. 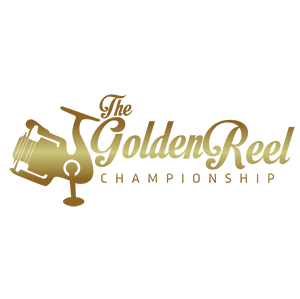 The defending Golden Reel Champion caught steady all match weighing 150-02-00. 4th on the day was Andy Power (Preston) who drew peg 39 on Laurel. Andy fished the long pole to an island fishing hard pellet and feeding the same. He ended up with 149-05-00 of carp and F1’s. Sixth in the frame was Steve Mazza with 125-12-00 from peg 19 on the Willow Lake. Steve fished caster shallow at 12m. 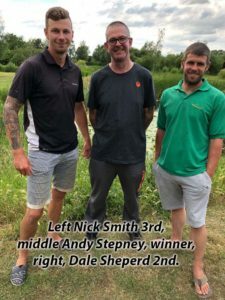 Our thanks to the brilliant Lindholme Lakes for hosting the twelfth qualifier and a big thank you to all the fishery staff. The final is certain to be a must view event in September with a powerful line up of top flight anglers already making their way to the 50k big money final. With twelve qualifiers remaining, you could be looking at the most powerful line up of match anglers in the country going head to head for the Golden Reel title. 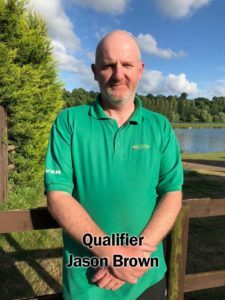 Due to clashes with Fish ‘O’ Mania, UK Championship and a festival at Lindholme lakes, attendances were a little disappointing for this latest mid-week qualifier. That being said, the field was very talented and difficulty to guess who or where it was going to be won. Conditions were warm and bright but a difficult and cold easterly wind changed the form book. Certain ‘flyer’ pegs didn’t produce as expected. Winner on the day was the very talented Jamie Hughes who now makes his way into the September Final. His remarkable performance now puts him into three major finals and a possibility of pocketing a total prize fund of more than £150k. Jamie’s MAP & Bag’em sponsors must be delighted with his performance and who would bet against him to win the 3 major titles this season. Jamie drew peg 76 on lake 5 and had a slowish start to the match. Then finding fish at 5m and long on the pole shallow to pellet, Jamie netted some quality carp to start his push towards an overall win. Later switching to his edge, went on to amass a superb 232-02-00 and his first final placing in the Golden Reel championship. However, Jamie was chased hard by second placed Mark Stainsby who drew peg 104 on lake 7. Mark fished the pellet waggler for most of his match but also caught a few carp to the feeder. Mark finished the day with 224-06-00 just 8lb short of the winner. 3rd on the day was Luke Bamford who drew peg 80 on lake 5. Luke’s attack was paste at 13m & short to weigh a very impressive 189-14-00. 4th placed Steve Openshaw drew peg 102 on pool 7 and fished pole and pellet shallow weighing in 157-08-00. 5th on the day was Rob Morris from peg 85 on lake 5. Rob fished the feeder with pellet and later switched to his edges on the pole to weigh in 156-03-00. 6th placed Grant Albutt (Drennan) drew peg 50 on Lake 3 fishing bomb and pellet to the far bank for most of his fish. Later fishing his edge with the pole & corn to finish the day with 150-08-00. Our thanks to Roy Marlow and all his staff for hosting yet again a superb qualifier. A respectable 59 anglers turned out for this latest qualifier. Conditions on the day were warm, bright with a gentle breeze. Most of the field targeted fish swimming shallow with pole and pellet. Winner on the day was Richard Bond (Tri-Cast / Van Den Eynde) with a weight of 161-12-00. Richard caught shallow on pellet and later down his edges landing carp and F1’s from Falcon Lake, peg 2. Rich Progresses to the September Grand Final. 2nd on the day was Tom Edwards (Frenzee / Dynamite Baits) with 156-04-00 from Osprey, peg 5. Tom fished short with pellet and down his edges landing carp and F1’s. 3rd placed Sam Morgan (Westwood Lakes) drew peg 3 on Osprey weighing in 149-04-00. Sam fished short with pellets and later caught down his edges. 4th on the day was Carl Lee-Hopps with 129-08-00 of F1’s from peg 7 on Osprey. Carl caught short and shallow with pellet. 6th in the frame was Andy Bennett with an all F1 catch of 112-06-00. Andy drew peg 20 on the Falcon Lake. 83 anglers turned out for this latest qualifier. Conditions on the day were bright sunshine but a cold easterly breeze. The drop in temperature stopped the fish from feeding to a point and weights were down compared to a few days previous. That being said, the brilliant Viaduct Fishery still provided plenty of excellent weights. Over all the winner on the day was Paul Morris who drew peg 121 on the Campbell Lake. Paul fished 8mm pellet on the pole to depth and later down his margin feeding 6mm pellet as feed. His total weight was 184-08-00, well over 50lbs clear of his nearest rival. Paul progresses to the Grand Final in September. Second on the day was Nick Miller (Mossella) who drew peg 111 on Campbell. Nick chose to fish bomb & pellet both long and short landing a very impressive 130-14-00 of carp. Third placed David Crandon drew peg 94 on the Cavy Pool and fished pole and pellet down his edges recording a weight of 128-02-00. Fourth on the day was Danny Bache (Bag’em). Dan drew peg 135 on Campbell and fished the long pole pinging pellets and later switched to his edges to land 116-08-00 of carp. Sixth overall was Chris kitchin (Matrix) who drew peg 61 on the Lodge Lake. All in all, an excellent qualifier well organised by the Viaduct staff. Our sincere thanks for hosting a superb qualifier. Conditions for the 8th Golden Reel Qualifier were far from perfect with heavy cold rain overnight, a stiff north wind and temperatures of just 5C. Hardly late April conditions which was more like January weather to say the least. 72 anglers braved the adverse weather and it was Adam Major (Wensom Valley, Matrix / Marukyu) who won the day. Adam drew peg 4 on the Beastie Lake and fished short with pellet finding some quality carp. Later switching to his margins with dead reds to finish the day with 152-04-00 and a place in the September Grand Final. Second on the day was local rod Jon Whincup (Frenzee). Jon drew peg 7 on the Beastie Lake and chose to fish the 14m pole with pellet to land an impressive 124-02-00. 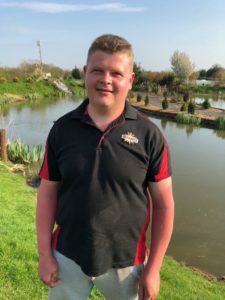 Third placed Lee Thornton (Middy) drew peg 5 on cedar fishing most of his match down the edges with maggots weighing in 117-01-00. Nick Smith was fourth overall with a weight of 106-04-00 from peg 26 on Oak. Nick chose to fish a simple but effective match with the short pole & pellet landing some good carp. Fifth on the day was Jimmy Brooks who drew peg 24 on cedar. Jimmy fished the long pole with pellet and later switched to his edges with maggot to land 104-03-00. Sixth overall was Matt Higgins from peg 7 on the Elm Lake. Matt fished the short pole with pellets weighing in 97-13-00. All in all, conditions were far from perfect but a big compliment to Decoy Lakes, which as always produced some excellent sport. Our thanks to Decoy Lakes and all the fishery staff for hosting an excellent qualifier. 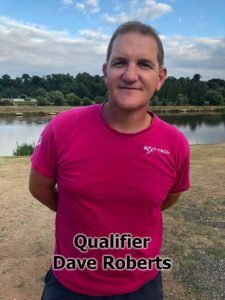 Considering the number of major events clashing with this latest qualifier, numbers were good with 82 anglers turning out to hopefully qualify for the £50K September final. Conditions at last were perfect with highs of 23C and a gentle SW breeze. The previous two days of very warm sunshine certainly woke up all the resident F1’s and carp and the match produced a staggering 48 100lbs+ weights topped by three weights over 200lbs. Winner was Les Marshall (Dynamite / Elite Elastics) who drew peg 17 on the Spey Lake. Les fished worm down his edges and caster shallow, landing a massive 266-11-00. Fishing a near perfect match weighing in mainly F1’s to finish the day over 30lbs clear of second place. Runner up today was Steve Openshaw (Maruku / Mossella) who drew peg 70 on Covey 3. Steve fished the pole with caster shallow and worms down his edge landing 231-15-00. Steve is making it a habit of finishing second, so hopefully he will make the final soon. Third on the day was Ryan Lidgard with 201-05-00 of F1’s and carp. Ryan drew peg 104 on covey 5 and fished pellet down his edges and caster shallow. 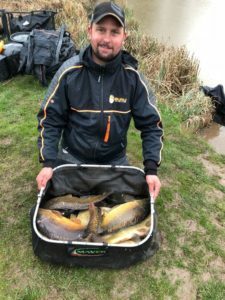 Fourth placed Kieron Marsden (Cresta / Dynamite) drew peg 5 on Marsh and chose to fish caster shallow and down his edges weighing in 199-12-00. Fifth in the match was Ian Kent (Spotted fin) who drew peg 80 on Covey 4. 6th placed Jake Nightingale fished pellet tight to the far bank and caster shallow to record a weight of 190-02-00. What a brilliant match for all the field with 48 big 100lbs + catches and three weights breaking the magical 200lbs barrier. Partridge Lakes must be the jewel in the crown with catches like these. A big thank you to Barbara and the entire fishery staff for hosting this remarkable qualifier. A near full house of 98 anglers participated in the 6th Golden Reel qualifier at the famous Glebe Fishery. Two anglers failed to show, otherwise a full house of 100 anglers competed today for a place in the £50k Grand Final. Winner today was Mark Griffiths (Daiwa/ Guru) who drew peg 1 on Lake 1. Mark found feeding carp instantly on the pellet waggler shallow and caught at pace all day. Fishing 8mm pellet, Mark caught carp to 5lbs every cast and also found a few carp at 14m on the pole and pellet down his edge. The Daiwa/Guru sponsored angler fished a near perfect match finally bringing a massive 272-15-00 to the scales. Second on the day was Welsh rod Richard A’herne (Frenzee) who drew next to the winner on peg 2, lake 1. Rich started on the feeder casting inches away from the far bank. This method provided plenty of bites from the feeding carp. Later, Rich switched to the pellet waggler and bagged for the last two hours of the match. At the whistle, Rich weighed an impressive 128-10-00 of carp. 3rd placed Lee Farmer drew peg 90 on pool 6 and fished the pellet waggler all day with banded 8mm pellet landing 123-05-00 of carp to 5lbs. 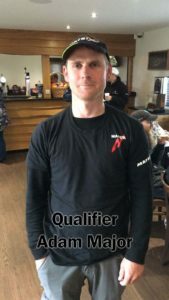 5th placed Mark Jones (Tredegar Tackle) drew pool 9 peg 120. Mark set off at pace landing around 80lbs of fish in the first two hours but his swim died later in the match. Mark recorded a weight of 113-09-00. 6th on the day was Sam Collett (Guru) with 112-01-00 from peg 50 on pool 3. Sam fished the pole down his edge with pellet for most of the match. As always a brilliant match at the Glebe and a very big thank you to Roy Marlow and all his staff. Lakes – Stepfield, Wood & Pathfield. A disappointing attendance for this southern qualifier with only 45 anglers attending. Again there was a big opportunity for the anglers in this area to enjoy an execellent days fishing at the fantastic Colemans Cottage fishery. Conditions were excellent with highs of 16C, a gentle breeze and fish feeding shallow and to depth. The winner today progressing to the 50,000 Grand Final in September was Pemb Wrighting who drew peg 8 on the Stepfield Lake. The Guru sponsored angler started his match catching carp shallow and later switched to the long pole with pellet landing a very impressive 151-08-00 of carp. Chasing Pemb all the way was Cliff Adams who drew peg 40 on the Wood lake. Cliff was just over 5lbs behind the winner after the 5 hours, weighing in 144-00-00 to long pole & pellet. 3rd on the day was Peter Upperton (Guru / Bag’em) who drew peg 2 on the Wood Lake. Pete caught his fish dobbing with pellet and later down his edge to record 143-08-00 at the scales. 4th placed Jason Collins (Map / Bait Tech) drew peg 1 on Stepfield again catching shallow on the pole and down his edges on pellet. Jason weighed an impressive 128-08-00. 6th on the day was Geoff Edwards from peg 38 on the Wood Lake. Geoff caught shallow and down his edge with pellets weighing in a level 124-00-00. All in all, a brilliant match hosted by the brilliant Colemans Cottage. Our thanks to all the management and fisher staff. 60 anglers fished this latest qualifier at Colmic / Bag’em Larford lakes. The conditions presented near flat calm water with a few light showers early in the match. The specimen lake still has very low water temperatures so sport was far from what it should be for early April. Certain pegs on the Match Lake produced some good results but the Specimen Lake remained very moody. Winner on the day was Ian Wood who drew peg 38 on the Match Lake. Ian was tucked away in the top bowl of the Match Lake and presented paste bait down his edge landing a superb 236-00-00 of carp & F1’s. Ian’s weight was over 135lbs clear of his nearest rival and puts him in with a chance of pocketing the massive £50,000 in the September final. 2nd on the day was Ray Lamb who drew fancied peg 30 on the Match Lake. Ray fished the pole with pellet landing carp and F1’s. During the match Ray lost a number of fish in the lily beds but still weighed a superb 130-13-00. 3rd placed Warren Jennings (Bag’em) is probably one of the most unlucky anglers out there. Having fished 4 qualifiers to date, He’s finished in the top 6 in all of them. Warren drew peg 48 on the Specimen Lake catching 4 big carp long with pellet then later switching to his edges to find 8 big carp down his margins to weight 126-12-00. Warren caught his edge with corn. 4th placed Lee Pesticcio (Mossella) had a brilliant match fishing peg 10 on the Match Lake. From the all in, Lee had fish showing in his margins so that became his main focus. Fishing pellet and corn, he went on to weigh 121-11-00 of quality carp and F1’s. 5th placed Alison Jones (Colmic) fished a very tidy match fishing corn down her margins landing 94-00-00 of quality carp and F1’s. 6th on the day was Phil Canning (Frenzee) with 85-07-00 from peg 66 on the Specimen Lake. Most of Phil’s fish came to corn on the pole. Our thanks to Larford Lakes and all the fishery staff. A disappointing turn out of 57 anglers due to a busy match calendar across the country and lack of support from the southern match anglers. 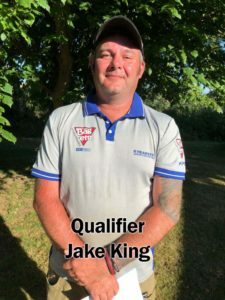 For qualifier to continue in the south of England the southern anglers will have to show their support for any future qualifiers or lose the opportunity of qualifiers in these given areas. Those that failed to support this qualified lost the opportunity to fish a brilliant match at the fantastic Monk Lakes fishery. Weights were tremendous so full credit to Monk Lakes and all their staff. Winner on the day was Ross Harold who drew peg 67 on Lake 2. Ross fished the 13m pole to the far bank of the lake with soft hook pellets landing 171-04-00 of carp. But it was a close run result and Ross was less than 2lbs clear of second place. That being said, he fished a brilliant match and now progresses to the grand final in September. Second on the day was James Taylor who drew peg 70 on Lake 2. James also fished the long pole to the far bank with soft hook pellets landing 169-14-00. One more fish would have put him through to the 50k final. 3rd placed Mike Macmillan drew peg 58 on Lake 2 and fished the long pole with soft hookers landing 162-10-00. His efforts could easily have put him through to the grand final. 2 more fish would have probably been enough. 4th on the day was Richard Bond from peg 112 on lake 3. Rich fished 14m with 4mm expanders weighing in 156-08-00. 5th placed Derek Gladwin fished pellet over groundbait long and down his edges to finish the day with 151-12-00 from peg 16 on lake 1. 6th on the day was Perry Stone who drew peg 8 on Lake 1 weighing in 136-08-00. A brilliant match and full credit to the brilliant Monk Lakes and all its staff. 90 anglers turned out for the second qualifier of the 2018 series of qualifiers. Conditions were not favourable with a stiff easterly wind and temperatures of just 4-5C. Furthermore, heavy overnight rain reduced the water temperature further. Needless to say, fishing was difficult with most of the resident carp and bream shutting shop. 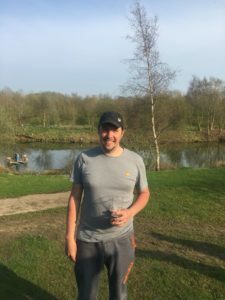 Winner on the day was Mick Bull (Frenzee / Bag’em) who drew peg 9 on the Arena Lake. Mick started his match on the method with popped up bread landing 3 early carp. Later switching to the 14m pole, Mick caught quality carp steady all match to hard pellet & corn to weigh an impressive 97-00-00. Mick makes his way to the September Grand Final. 2nd on the day was Pete Jones (Colmic) who drew peg 86 on the Specimen Lake. Pete had a great first four hours catching carp to 15lbs on the pole fished at 8m with corn. Later in the match, Pete switched to his edge to find some more quality carp. With an hour remaining, both of his swims died so he had to settle for 75-15-00 and runner up spot. 3rd placed Richard Maturi drew peg 82 on the Specimen Lake and fished at 10m for the duration of the match. Rich fished corn landing carp to 15lbs and weighing a total of 75-13-00. 4th on the day was Warren Jennings (Bag’em) who drew peg 11 on the Arena Lake. Warren fished at 14m with hard pellet and corn to weigh 65-03-00. 6th on the day was Steve Rocke (Larford) who drew peg 56 on the Match Lake. Steve fished the pellet cone short with corn to weigh 50-11-00. 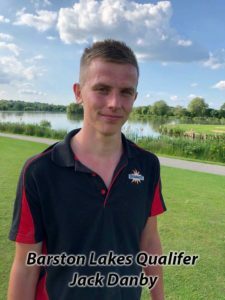 Our thanks to Larford Lakes and all the staff for hosting the second national qualifier. Our congratulations to Mick Bull for reaching the Grand Final. The first Golden Reel qualifier for 2018 took place at the fabulous Viaduct fishery on Saturday. 86 anglers turned out hoping to secure the first big money qualification spot. Winner on the day was Dan White (Garbolino / Spotted Fish) who drew peg 85 on Cary’s Lake. Dan caught on the 16m pole pinging pellets fished to depth weighing a very impressive 178lbs of quality carp. 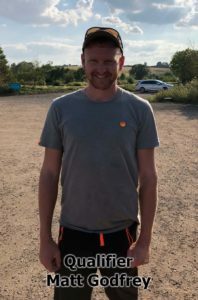 2nd placed Charlie Dalton (Rive Homestores) was right up there in the race to qualify falling just 5lbs short with a weight of 173-05-00 from peg 15 on Spring. Charlie caught most of his fish a meat fished in the margins fished at 8m. 3rd on the day was Luke Hancock who drew peg 112 on Campell. Luke fished pole & pellet fished at 14.5m with his 6m meat line producing some quality carp later in the match. Luke finished the day with 152-07-00. 4th placed Matt Blackmore ( Garbolino / Dynamite) continued his good form weighing in 140-09-00 from peg 113 on Cambell. Matt fished at 14.5 with meat and later switched to his 6m line with meat landing quality carp. 5th on the day was Nick Chedzoy who drew peg 111 on Campbell. Nick caught most of his fish on the lead with pellet and meat to weigh 139-00-00. 6th placed Warren Jennings (Bag’em) drew peg 114 on Campbell and fished long pole with pellet and meat short to finish the day with 138-06-00. So all in all, a brilliant qualifier returning very impressive weights from all the lakes. A very well done to all the Viaduct fishery staff for hosting a very impressive qualifier.